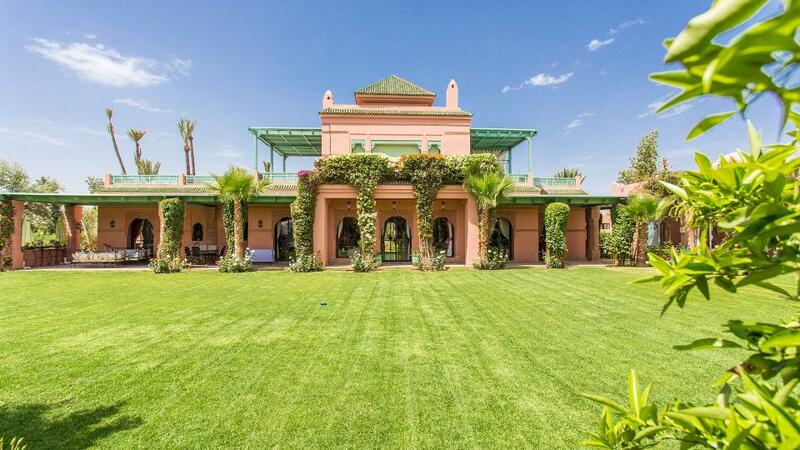 This beautiful villa is nestled in the heart of a magnificent private garden in the Palmeraie of Marrakech. The house is a lovely 4 bedroom property with stylish decor. 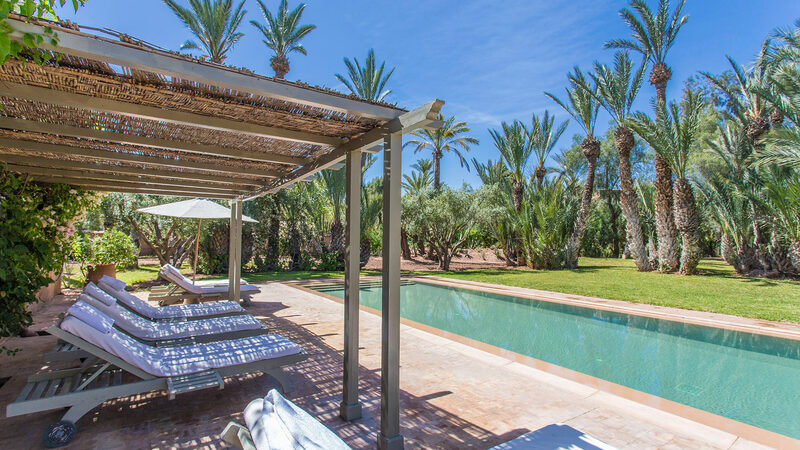 The villa is fully equipped and the perfect retreat for a holiday with your partner or family under the sun in Marrakech. 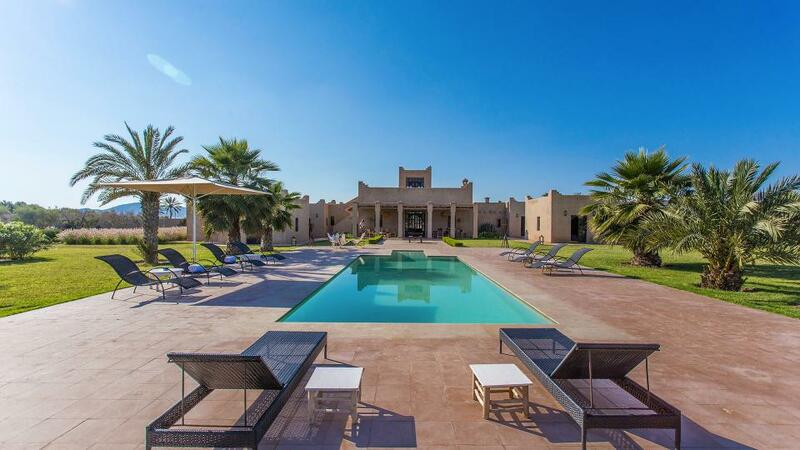 The villa is accessed by a large open patio in the form of an Arab-Andalusian garden. The entrance to the villa opens onto the large living room decorated in a very personal manner by the owner. Comfortable sofas are facing a large coffee table in front of a fireplace. Across the room is the dining room for 10 guests and a separate TV lounge. The dining room gives access to the kitchen and onto the garden where a covered terrace with a large dining table makes the perfect spot for al fresco dining. The living room features French windows with direct access to the main terrace with tables and lounge chairs. 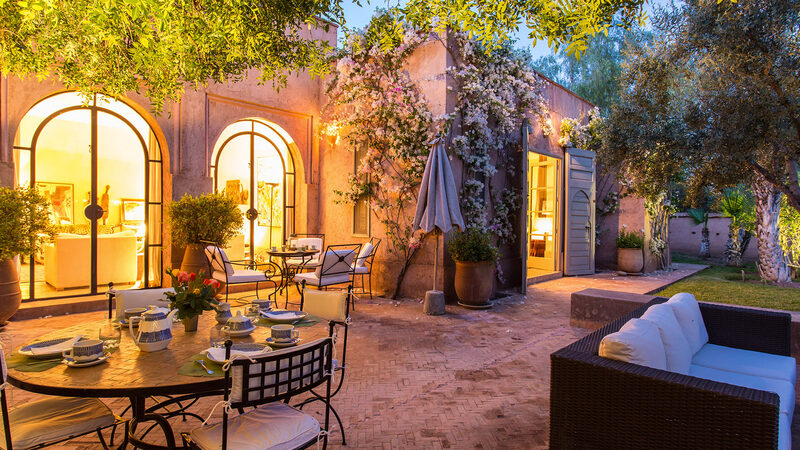 The lush garden unfolds from the main terrace with beautiful olive trees and palm trees rustling gently in the wind. The swimming pool can be seen from the terrace. 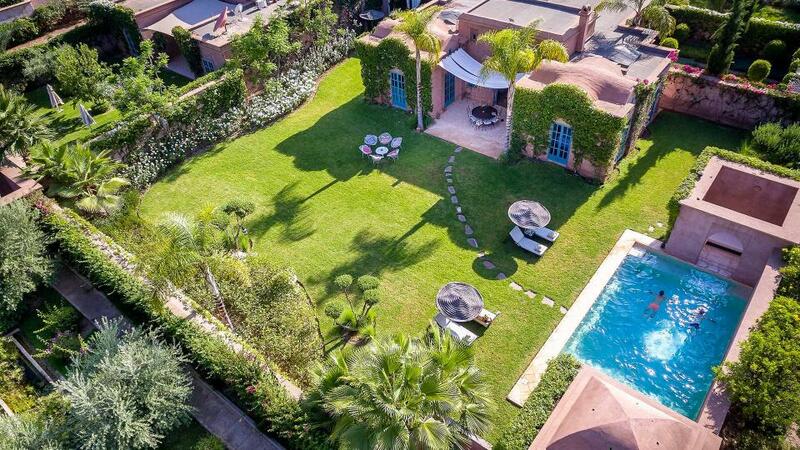 It is embellished with a pool house including toilet and shower, deckchairs, parasols. The pool is heated. The four bedrooms in the villa are air conditioned. They are all located on the ground floor. Each bedroom has its own ensuite bathroom, queen or king size bed and have direct access to the garden. The house linen is of very good quality. On the upper floor of the villa is a large covered terrace with fireplace, armchairs and sofas. 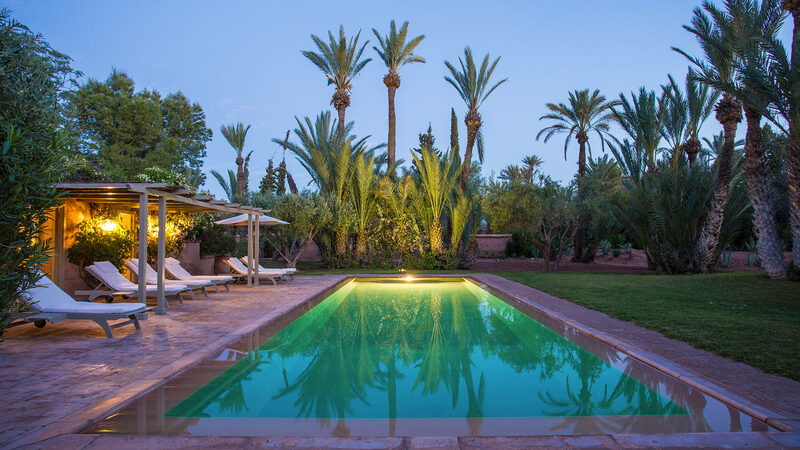 This is the place you will enjoy at sunset thanks to the splendid views of the Palmeraie and the garden. The manager, butler/cook and chief gardener all speak French (the manager also speaks a little English), and, with their assistants, contribute much towards an effortlessly satisfying stay. - Modo di pagamento accettato sul posto durante il vostro soggiorno : Pagamento in valute. 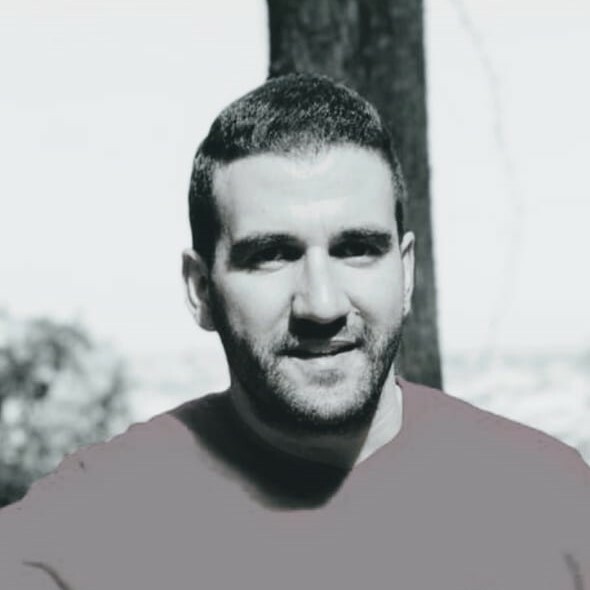 - Annullamento a meno di 45 Giorni prima dell'arrivo : 100 % del totale della prenotazione.